I'm studying Greek History and reading about the end of the Bronze Age. And after reading about the Dorians several times now, I'm confused about where the Dorians actually came from, the closest I can find is Wikipedia saying they were from Northern Greece. But if they were from there why would they come southward to the Greek Peninsula? Also, if they came from Northern Greece, were they of the same lineage as the Minoans and Mycenaeans? Or were they a completely separate ethnic group? Gradually, the void left by the collapse of Menelaus' Kingdom [i.e. Mycenae] had been filled by newcomers from the north, wandering tribes who would be known much later as the Dorians, in proud contra-distinction to the vanquished native Greeks. The Spartans, despite their attempts to present themselves as the heirs of Menelaus, were Dorians after all. The mountainous country north of the Isthmus [of Corinth] was their ancestral homeland. The fact that large parts of the Peloponnese were very fertile explains why they came. Whether it was a gradual migration or an invasion remains a topic of some debate. As we don't know what caused the collapse of Mycenaean civilization and as there are no written records between the time of this collapse and the emergence of the Greek city states around 800 BC, it is impossible to be certain of the relationship / interaction between Mycenaeans and Dorians. However, this did not stop Sparta and other city states from adopting heroes from the Mycenaean age and claiming them as their own (but this should be seen for what it was - propaganda). Mycenaean Lakedaimon vanished around 1200, Dorian Sparta was created somewhere in the tenth century.....Of what happened in between we have no knowledge. I have not seen any evidence of a relationship between the Minoans and the Dorians (perhaps someone else can throw more light on this). Paul Cartledge, 'Sparta and Lakonia' (2nd ed.) Presents and assesses various hypotheses which relate to the Dorians in southern Greece. Rather than the Sea Peoples, the ancient Greeks—ranging from historians like Herodotus and Thucydides in fifth-century BC Athens to the much-later traveler Pausanias—believed that a group known as the Dorians had invaded from the north at the end of the Bronze Age, thereby initiating the Iron Age. f.n.45 This concept was once much discussed by archaeologists and ancient historians of the Bronze Age Aegean; among their considerations was a new type of pottery called “Handmade Burnished Ware” or “Barbarian Ware.” However, in recent decades it has become clear that there was no such invasion from the north at this time and no reason to accept the idea of a “Dorian Invasion” bringing the Mycenaean civilization to an end. Despite the traditions of the later classical Greeks, it is clear that the Dorians had nothing to do with the collapse at the end of the Late Bronze Age and entered Greece only long after those events had transpired. So, according to Cline, the Dorians had no role in the collapse of Late Mycenaean society. That f.n. 45 refers to Middleton, G. D. 2010. The Collapse of Palatial Society in LBA Greece and the Postpalatial Period. BAR International Series 2110. Oxford: Archaeopress. The Dorian identity may have only been formed much later than c.1200 and none of the significant Dorian centres were prominent in postpalatial times. The mixed origins of what became Dorian populations also seems indicated by one of the three standard tribal names, Pamphyloi, or 'people of all tribes' although in some Dorian areas some or all of these standard names were not present (e.g. Corinth) and in others extra tribal names appear. In other words, it was an origin myth - the Dorians were created after the collapse. By the way, Cline does not bring up the Dorians again (i.e. after dismissing their role in the collapse - as per quote above). Historical Linquistics can perhaps help here. 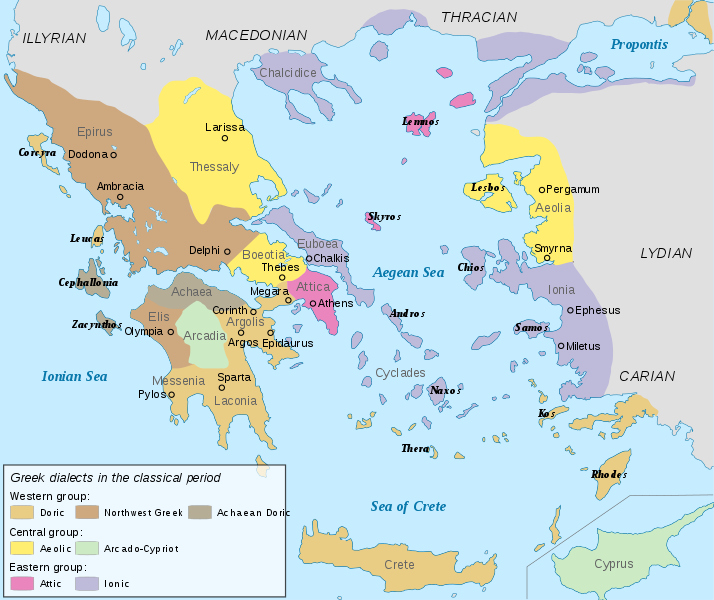 While the existence, timing, and nature of any "Dorian Invasion" is controversial, we can gather a lot from looking at ancient Greek dialects and their known distribution. Due to that, where the Dorian dialects came from is not controversial at all. It is widely accepted that Doric originated in the mountains of Epirus and Macedonia, northwestern Greece, the original seat of the Dorians. Now its a general (but not foolproof) principle that you can find a language family's homeland on a later language distribution map by finding the location of its oldest offshoot. So what we are looking for here is the border between Doric and Northwest Greek, and particularly where the rest of Northwest Greek is. Notice the Northwest Greek area is in the, well, northwest of Greece. The areas south of there are all former Mycenaean-speaking areas. While the timing and method may not be known as of now, it is accepted that the Dorian speakers moved from out of that area to effectively take over all of southern coastal and insular Greece, bar inland Ionia and Cyprus. The rest of Greece continued to house everybody else, who developed into their separate dialects as outlined above. The Dorians, were a primitive Greek tribe who originally came from the Northwest of Greece-(the region called, "Epirus"). This was and is still the most mountainous and pastoral region within Greece proper-(specifically, the Hellenic mainland. This is the region where Hades and The Elysian fields were located, as well as the homeland of Alexander The Great's Mother, Olympias). For most of ancient history, the Dorians lived in relative obscurity throughout the mountainous valleys of Northwest Greece. However, by the 1100's BC/BCE-(about 100 years after The Trojan War, as well as 500 years after a prosperous Mycenaean civilization in the Peloponnese), the Dorians began to invade much of the Hellenic mainland and settled into the Peloponnese in big numbers until 800 BC/BCE, essentially destroying or supplanting the centuries old Mycenaean civilization. The Dorian invasion of mainland Greece is often (somewhat disparagingly and sarcastically) referred to as, "The Greek Dark Ages" and from the Mycenaean perspective,it would have appeared to have been an ensuing Dark Age. Comparatively speaking, the Dorians, were culturally unsophisticated and primitive, though they were known, perhaps even notorious for their warlike temperament. Were the Dorians ethnically related to the Mycenaeans? Yes, in all likelihood, the Dorians were Hellenic compatriots, though the Mycenaeans would probably have viewed the Dorians as having been barely Hellenic or semi-Hellenic at best. Keep in mind that the Dorians came from a region of Greece that literally neighbors the larger region of Illyria-(which, at the time, was comprised of the majority of present-day Albania, the nearby region of Kosovo and much of the Yugoslav interior) to its North. The Dorians, though of Greek ethno-linguistic extraction, may have had Illyrian linguistic and cultural influences which would have appeared to have been somewhat foreign to the more culturally refined and cosmopolitan Mycenaeans. According to my research, the Dorians who invaded Greece in the twelfth century BC originated from Northern Europe. Some of them inhabited the island Rügen in present-day Germany. This island was densely populated in the Bronze Age. In the beginning of the 1800s (AD), you could still see 1239 tumuli from the Early Bronze Age there (NBA terminology). The present name Rügen is due to the people who inhabited the island after the Dorians and other tribes had left. One reason for leaving southwards for people in Northern Europe could be an Icelandic volcanic eruption 1190 BC (cfr GISP2 data from the Greenland ice). According to the Odyssey (19:177) the Dorians and some other tribes inhabited Crete, which was probably the ancient name of Rügen. They later invaded the island we now call Crete (in addition to other areas) and brought the name with them (as Englishmen brought with them their names to the US, e.g. «New England»). As far as I know, the name Crete (Κρητη) has not been found in any writings prior to the Dorian invasion; the Egyptians called the island «Keftiu». The migration was chaotic and took a long time. My hypothesis needs to be verified by new techniques such as aDNA and/or strontium isotope analysis. Reference to the number of Early Bronze Age tumuli at Rügen: "Archäologische Entdeckungen in Mecklenburg-Vorpommern, page 69: Article by Lars Saalow and Jens-Peter Schmidt. Schwerin, 2009. ISBN 9783935770248." Not the answer you're looking for? Browse other questions tagged ancient-greece bronze-age greek-dark-ages dorians or ask your own question. Is there any archaeological evidence for the Dorian Invasion of Greece?